But it’s a lot easier when you have at least something in common. 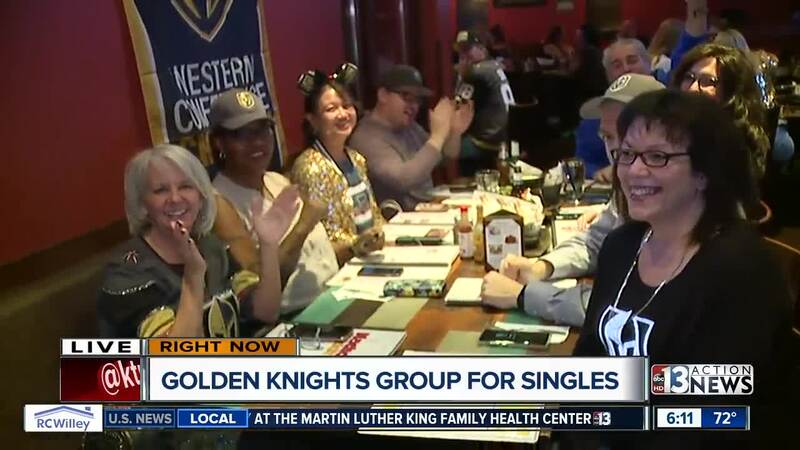 That's the idea behind Golden Knights Singles - For the Love of Hockey - a private Facebook group with more than 750 single, VGK-loving members. Criteria for entry into the group are simple: members must be single and fans of the Vegas Golden Knights. Matt Heuberg, who works full-time in IT, said he started the group partially as a joke after he asked if anyone was single on another VGK fan Facebook group. Someone there suggested he start a group for singles - so he did. The group is active - several members post, comment and react to threads every day. And although the conversations typically center around Golden Knights hockey, members discuss other things too. "You see something that sparks your interest," said Heuberg. "Someone posts about their dog, something funny about their day or something funny about the Knights in general. That kind of sparks your interest, you get a conversation going, maybe you privately message them. I think it's a little more personal." Heuberg said he hopes the group is a nice alternative to dating apps like Tinder and Bumble. And just seven months after it launched, the group is not only getting new members almost daily, but there have been some success stories. John An met his girlfriend Dani in the group. They started talking on the page at the end of June and went on a date a week later. They talked so long at the restaurant the night of their first date, An said they shut the place down. They've been together ever since - even making a trip back to An's native Chicago recently. An said it it weren't for the group, they wouldn't have met. "It isn't like dating sites or matchmaking sites where the expectation of a romantic relationship is there so there's a lot of pressure," said An. Mike Mitchell said he also found success on the VGK singles Facebook group. Just last week Mitchell met a woman from the page for a first date, where they, of course, watched a Golden Knights game. Mitchell said they've had two great dates so far. He's looking forward to a third this weekend. Other members said they may not have found romantic love in the group yet, but they've found a new group of friends. And just like romantic relationships, friends need to have something in common too.